Boku is a payment platform that enables online gamblers to make swift transactions by using only their mobile phones. It is a great method for all gamblers who do not posses debit cards, have no banking accounts or have a poor credit history preventing them from applying for credit cards at a bank. The method is accepted by a number of online casinos although it is not as widespread as other banking solutions like Visa, Mastercard, Skrill, Neteller, or Paysafecard. Founded in 2003, Boku started its history as Vidicom Limited, which sought funding from venture capitalists to kick-start its application Mobillcash. Several years later it incorporated Boku Inc. and re-branded itself as Boku. The service was launched in 2009 after they had secured $13 million from investors and acquired Mobillcash and Paymo. Boku adheres to Payforit rules and regulations and makes it its business to set a billing engine and to process payments from customers to merchants. Today, Boku has grown to become one of the most preferred mobile billing service providers in the world and is especially popular among casino players and online shoppers from the United Kingdom. If you want to know how the method is used for topping up your online casino balance, you can check this article out. Boku has taken the now outdated PSMS technology (Premium Short Message Service) to a whole new level. When the PSMS technology first emerged, its main purpose was to help mobile users purchase ringtones by sending text messages. The technology gradually evolved, allowing app stores and other websites to sell more versatile digital content like music and online games. 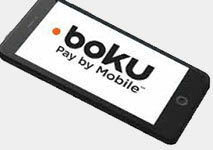 Boku combined the ease of use of PSMS with the reliability of debit and credit card money transfers, giving casino players the chance to fund their balance with a single tap in their touchscreens. Proud winner of the 2014 Payment Awards in the Best Alternative Payments category, Boku allows you to make payments via your cellphone, without the need for bank accounts, credit cards or any other type of payment information. Before you are able to top up your casino balance with this method, you must ensure you have signed up for the services of a mobile network operator that works with Boku. There is a good chance your mobile network operator would support the services of Boku since the latter has established partnerships with 173 mobile carriers which work with customers from more than 51 world markets. Some of the most popular mobile carriers affiliated with Boku include well-known names like Vodafone, T-Mobile, the Japanese NTT DoCoMo, Swisscom, O2, and the Italian telecommunications company TIM, among many, many others. Boku has gone to great lengths to promote its business by establishing partnerships with large consumer corporations. In 2016, the San Francisco-based company introduced another innovation in the field of mobile payments which was branded as Boku Direct, giving online and mobile gambling operators the opportunity to integrate the company’s mobile billing service directly into their own deposit systems. The introduction of Boku Direct resulted from the company’s partnerships with major online vendors and app stores like Facebook App, Google Play, Spotify Premium, the Sony PlayStation Store, and the Microsoft Windows Store. Microsoft users, for example, were enabled to pay for online purchases from any Windows-based device they choose by connecting their mobile phone numbers to their Microsoft Windows accounts. In a similar fashion, casino players were enabled to make recurring deposits with Boku without having to input their mobile phone numbers each time they initiate transactions. There is also Boku Checkout, which works in the same manner but is intended for one-time payments since the information concerning the transaction is not stored in the database of the Boku payment portal. The bottom line is having a cellphone and a mobile plan is all that is needed for a player to use Boku. This mobile billing-based payment solution gives casino players the chance to make smaller deposits whose value is then added to their mobile bills at the end of the month. In its essence, paying with Boku is the same as being charged by your mobile network operator for making a call. Boku can also be used by players who use prepaid mobile plans. In their case, the deposited sum will be deducted from their available prepaid balance if said balance is sufficient to cover the money transfer. Many small-scale online gamblers would prefer Boku over other available banking options because there are no costs associated with these mobile billing transactions. Having a cellphone and a phone plan is all that is needed for a consumer to use Boku. It does not matter which carrier you are subscribed to, Boku has relations with every major carrier in the UK and 250 foreign carriers in 68 countries across the globe. It is no wonder an increasing number of recreational casino players chose to make their deposits with Boku. Making a deposit through this mobile billing platform is but a piece of cake, not to mention it allows you to complete the payment in less than ten seconds. Here is a step-by-step guide on how the entire depositing process works. When you are ready to make a deposit, go to cashier page and select the ‘Pay by mobile’ option from the list of available deposit options. You will be transferred to Boku’s platform, where you have to submit your mobile phone number and confirm the sum you wish to deposit. You will be sent a text message to which you must reply with “Y” (short for “Yes”) to confirm the transaction. The text message is sent for security reasons and will cost you nothing. Once the deposit clears through, which should take no more than a minute, Boku will send you a receipt and you can start playing immediately. The deposited amount will be added to your mobile phone bill at the end of your billing cycle. If perchance your deposit fails to go through for one reason or another, you can get in touch with Boku’s customer support by dialing the number displayed at the end of the authentication text message. The status of Boku transaction is normally confirmed with text messages as well, informing the players whether or not their payment has gone through. Typically Boku deposits are unsuccessful whenever a player has exhausted their prepaid mobile plan’s credit limit for the respective month. If you are confident this is not the case, you can repeat the steps we listed above to initiate the deposit once again. Players can also keep a better track on the deposits they conduct with Boku by signing up for the method’s customer care portal where they can view the history and status of all previous transactions they have made. As straightforward as it is, Boku falls flat in one respect and it has to do with withdrawals. The system is designed to process payments one way only, which is to be expected since the only way for you to receive your winnings with this method would be for the casino to credit them to your mobile balance and we all know this is impossible. In other words, Boku can be used for depositing at online casinos but as a mobile billing service is unavailable for withdrawals. The same is, in fact, valid for all other deposit methods of this kind, including Payforit that is also available to players from the UK. To cash out your casino winnings, you would have to request a bank transfer or have the casino send you a check. Alternatively, you can use a third-party payment service to withdraw your money from the casino, the most popular options being the e-wallets by Neteller, Skrill, ecoPayz, and PayPal. If you are unsure which alternative withdrawal method is best suited for your needs, you can easily get in touch with your casino’s support team to ask for assistance. Boku has gained traction among small-scale casino players because it enables them to make small deposits at no additional costs. Boku is a very budget friendly service. It has practically no fees or hidden costs. Even the confirmation text message is free. There is no need for Boku to charge players for carrying out their transactions for the simple reason it collects a cut of around 30% from the gambling operators supporting it as a banking option. What this means is if a given player deposits £30 with Boku, their balance will be credited precisely with that amount. While free, Boku limits you as to the amount you can actually spend daily. The daily limit is set at £30 per mobile number. Even when making payments to different casinos or stores, Boku will recognize the mobile number and block further transfers if the player’s daily deposits exceed £30. It should be noted that you can only make payments in sums divisible by 10 such as £10, £20, £30, unlike other services which let you deposit sums like £173.50, for example. Respectively, this makes it impossible for players to deposit sums under £10. Additionally, your mobile billing carrier may impose spending restrictions on such services. For this very reason, Boku is unsuited for casino players who are into wagering higher amounts of money per day. Boku is a very budget friendly service. It has practically no fees or hidden costs. You only pay the amount you spent online. Even the confirmation text message is free. Boku is an excellent payment solution when it comes to efficiency and discretion. You do not have to register to use its mobile billing service which cannot be said for alternative payment methods like the e-wallets by PayPal, Skrill, Neteller, and ecoPayz where players are expected to undergo registration and verification procedures. The only thing you need when using Boku is your phone number. Depositing with Boku is incredibly easy, accessible, and everyone can do it. As a matter of fact, this method opens the doors of virtual casinos to a whole new crowd of players who may own mobile phones but have no credit/debit cards or bank accounts. All you need to top up your account with Boku is your mobile phone and a sufficient balance if you are using a prepaid plan. You need not concern yourself with bank accounts, credit cards, bank statements, checks and other inconveniences. Of course, this makes Boku a great method for those who wish to retain their privacy or are skeptical about giving out their bank account or card number to the online casino. Boku also ranks as one of the most straightforward payment methods out there. Players are not expected to enter any passwords, security codes, or long card numbers and voucher codes as is the case with the method Paysafecard, for instance. If the casino you play at uses the Boku Direct platform, you need to enter your mobile phone number only once and the system will detect it automatically upon subsequent deposits. If you hold accounts at multiple online casinos, your mobile number and smartphone will still get recognized by the Boku Direct system, saving you the hassles of having to enter this information time and time again. Another positive of using Boku is that you do not have to worry about slipping out of control with your gambling. As was explained in the Fees and Limits section, this mobile billing payment solution restricts your daily casino deposits to the humble amount of £30. Even if you do wish to continue playing after exhausting this amount, you will not be able to process a deposit within the same 24 hours, at least not if you are using Boku. As part of the mobile payment industry, Boku itself is subjected to very strict regulations which can also be interpreted as a big plus. The company’s operations are overseen by major regulatory authorities like the government-approved UK communications regulator Ofcom (short for Office of Communications), its partner the Phone-paid Services Authority (PSA), and the Association for Interactive Media and Micropayments (AIMM). Boku is incredibly safe, partially because of its small transaction limits. Even if somebody steals your phone and attempts to use it for purchasing with Boku, they will not be able to spend more than £30 within one day. Respectively, you will have a sufficient amount of time to report your phone was stolen and take the necessary measures. As convenient as it is, Boku will not appeal to all types of online gamblers. For starters, the spending limit is way too low for anyone who does not play just for fun. Any high rollers would not prefer this payment method over a more liberal one. Depositing in increments of £10 for a daily limit as low as £30 may not even suffice to appease the appetites of some recreational bettors. Many players are willing to overlook the ease of use Boku offers in favor of a payment method that allows for more substantial deposits. 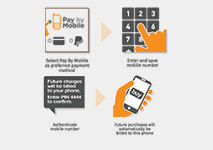 Such players are more likely to go for Paysafecard vouchers or register an account with a supported e-wallet. Some mobile carriers like Vodafone, for example, would allow long-time customers of good standing to increase their spending limits to several hundred upon request. Unfortunately, those who use Boku will have to suffer the £30 daily restrictions even if their mobile carrier has agreed to increase their spending limit for the month. As we already informed readers, the Boku Direct system remembers players’ mobile numbers and phones which helps them initiate deposits with a single tap at many different casinos. On the bad side of things, the system would also recognize you have already reached your £30 daily limits even if you attempt to make a payment with another gambling operator. The rigid deposit amounts with Boku may also prove to be problematic for some small-scale recreational players. Imagine the following situation – you come across a new online casino and are willing to give it a try by taking advantage of a bonus that requires a minimum deposit of £5. You are reluctant to deposit more than this humble amount because you simply wish to try the casino and see whether it suits your needs. With Boku, you will be unable to process your deposit because it handles payments in batches of £10, £20 or £30 only. Last but not least, the inability to withdraw funds is a major detriment to people who are actually hoping to make a buck online and cash out their bounty. This is a one-way banking option which does not support withdrawals due to its specifics – you cannot receive your casino winnings via your mobile bill. And indeed, many casino players would prefer to spare themselves from having to search for another method for withdrawals. Such players are likely to give up on the idea of using Boku altogether. Boku remembers your phone number so you would not need to enter it every time you wish to make a deposit or a purchase. Security is a recurring reason for concern among some casino players, who are unwilling to enter any sensitive financial information that is normally required to initiate a deposit with many of the available payment methods. Such players are recommended to try Boku – the method is considered one of the safest ways of transferring money to one’s casino balance for the simple reason the payments are not linked to a particular credit card or bank account number. Basically, the only information you input when depositing with Boku is the desired deposit amount and your mobile number, which naturally cannot be used for the purposes of misappropriation and identity theft. The text message confirmation further reduces the chances of a fraudster charging your mobile bill for their own purchases. Even in the event that someone gets a hold of your phone number, they still cannot use that against you, since every transaction must be confirmed via text message from the specific phone number it was issued to. Furthermore, all information sent to Boku is encrypted and thus made unreadable to prying eyes. In fact, the same applies to the majority of licensed online casinos that accept Boku as a deposit method. They, too, would use high-level encryption technologies and firewalls to protect players and their balances. Boku is a quick and convenient way to deposit at online casinos. It takes less than a minute to process a deposit and the player’s anonymity is guaranteed. There is no registration process, you can start using it right away. It is so simple anyone can make use of it. But in spite of these perks, Boku is not a perfect payment system. The deposit limit is ridiculously low, so much so that even gamblers on a budget would lift an eyebrow in surprise. This service seems to be designed for Internet micro-transactions on smartphone apps stores or low-cost subscriptions, not for high-profile gambling. There are other services out there that would much better satisfy online gamblers’ needs for quick deposits and a higher spending limit.